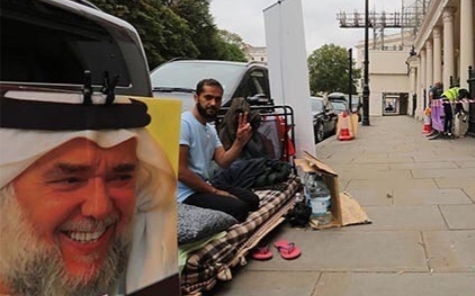 The activist «Ali Mushaima» continues his strike and protests in front of al-Khalifa regime embassy building in London in protest against depriving his father, the symbol and mujahid «Professor Hassan Mushaima» the right of treatment and medicine in the jails of al-Khalifa entity. After 44 days, Mushaima continues his hunger strike despite his deteriorating health and as the month of Muharram al-Haram started on Tuesday, September 11, 2018, he raised the flags of Ashura in a declaration of adherence to Hussein’s resistance. It is noting that on the 39th session of the United Nations Human Rights Council in Geneva, Human Rights organizations have demanded the release of the symbol "Hassan Mushaima" and provide him medical care. Mushaima is sentenced to life imprisonment and he was deprived of medical care despite his old age and suffering from multiple chronic diseases such as diabetes, high blood pressure, arthritis, and has not been screened for cancer checkups since September 2016 to August 2018.